Therapists work closely with teachers to demonstrate techniques that can be incorporated into the regular classroom routine. Specialized Evaluations, for students with mild, moderate or severe disabilities who may require augmentative communication devices, assistive technology, therapy evaluations and non-standard psychological or educational evaluations. 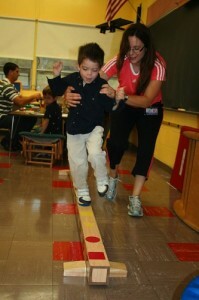 Therapy Services, coordinated with regular classroom activities. Our occupational, physical and speech therapists work closely with teachers to demonstrate techniques that can be incorporated into the normal classroom routine. Home-Based Services, for students who are unable to attend school due to medical issues. Our experienced, fully certified special education teachers provide the instruction, and therapy services are also available in the home. Adaptive Equipment and Assistive Technology, based on a thorough evaluation of students’ needs. We adapt wheelchairs, supply adaptive physical education tools and set up new classrooms to ensure access for students with physical disabilities. Information about all of these services will be available at The Matheny School’s Open House, which will be held on Wednesday, October 9, from 10 a.m.- noon, at 65 Highland Ave. in Peapack, NJ. For more information or to R.S.V.P., call (908) 234-0011, ext. 234, or email mathenyschool@matheny.org. For more information about Solutions for Schools, call (908) 229-7342 or email mathenysolutions@matheny.org. This entry was posted in Uncategorized and tagged Matheny Solutions for Schools. Bookmark the permalink.